The Flamboyant Introvert: Prius C: A sub-compact hybrid, at a non-hybrid price. Prius C: A sub-compact hybrid, at a non-hybrid price. 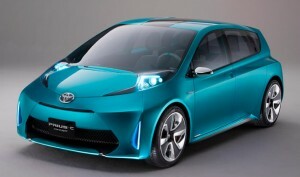 The newest Prius, available for only 2 months now in the US, is a compact fuel-efficient hybrid. One thing it is not, however, is a Prius. The car is really a Yaris hybrid. But, given that “Prius” is basically synonymous with “hybrid” among average Americans, and that the Yaris may seen by some as an “econ-o-box,” it is a smart marketing move on Toyota’s part to label it as a Prius. (In its home country of Japan it isn’t called a Yaris hybrid either, its called the Aqua). Despite the misnomer, both the pricetag and the size reflect its true roots as a Yaris. Sticker, at just under $19,000 baseline, is over 20% less expensive – $5000 less – than the standard model. Of 337 different models available for sale in 2012, only 17 cars are cheaper – and none of them are hybrids. The first time I was in the original Prius, I was shocked at just how large the interior felt. It almost seemed more like a small minivan than the “compact” car it was classified as. I guess this shouldn’t have been surprising given how most long-lasting models have been super-sized over time (the modern Honda Civic, for example, is an entire 3 feet longer than the original Civic) – but it was not that long after the debut of the first US hybrid, the Insight, and I had assumed the Prius would be a 4 passenger version of that tiny car. Ever since, it has seemed rather odd to me that the vehicle with the best (standard) mileage for sale in the US is one which falls in the 4th highest of the 5 size ratings. Surely, I imagined, something with a Prius like drive-train, but in a mini or compact size, should be able to get even better mileage. It took them 12 years to do it, but the “Prius” C is just that. It is over 1 1/2 feet smaller, 2 inches thinner, and almost 2 inches shorter than the original Prius, as well as 500lbs lighter – it’s actually lighter than many non-hybrid compact cars, such as the Fit, the Miata, and the new “Mini” Cooper. The ‘C’ in the name stands for ‘City,’ where the small size would make parking easier and the lighter weight will help fuel mileage. As it does, at least in city traffic, where its meant to be used. By US EPA standards it gets 53mpg city, the highest rating of any (non-electric/plug-in) mass-produced commercially available highway capable auto in the country. At the same time, the EPA gives it 46mpg highway, slightly worse than the original Prius, and the two average out to a mixed rating of… 50mpg, exactly the same as the original Prius. However, it is very interesting to note that – although the marketing department is limited by law to only advertising the EPA generated numbers – Toyota’s own engineers estimate the mileage at a whopping 82mpg(US) under Japan’s mileage testing system. One tester even got 57mpg on the excessively hilly streets of San Francisco, so the official ratings are clearly conservative. Even a lead-footed car-guy tester with Car and Driver beat EPA with 55mpg on his test run. Some of the reviews coming from professional car reviewers are pretty much what you would expect before even looking at them: this is a nice car – looks good, comfortable though small inside, handles decently, lots of technology and gadgets – but it doesn’t have enough acceleration. Its 0-60 is around 11 seconds. This apparently feels like driving through syrup to someone who is used to reviewing modern overpowered passenger cars, but for comparisons sake, a semi-tractor-trailer measures its 0-60 time in minutes or miles, and they are apparently capable of merging onto freeway onramps somehow. The more a particular reviewer is able to shift their frame of reference from performance to fuel economy, the more they liked it. Bonus: everyone agrees that its 25-40mph acceleration of 3.6seconds – more what you’d use in city driving – is plenty. Then again, even though it is smaller than its predecessor, it isn’t really that tiny. While it is 1.5 feet less in front to back length than the original Prius, it is still a full 3 feet longer than the Scion iQ, another city car made by Toyota, which (unlike the Smart Car) has room for 4 passengers. The last 2 passengers might not be in luxury, but the reality is that most people, most of the time, don’t have 4 adults in the car. They have one, maybe 2, and possibly one or two children. So the iQ would probably be an appropriate size for many, if not most, households – especially if it’s the second of two cars. Of course the iQ gets nowhere near the C’s mileage (36/37), it is also $3,000 less. I guess I will just have to keep waiting for a car to come out with the size of the iQ but the mileage of the Prius C. They are heading in that direction. If one was going to get a new car now, the Prius C is the most efficient car out there, at a pretty reasonable price. In a decade or two, when used ones can be found on Craigslist for a few thousand, I might just pick one up myself. In the meantime, hopefully an ecomodder with a bigger bank account than mine will pick one up. I’d love to see what could be done with it in the right hands. Looks like a nice replacement for my Matrix, but I've really got my sights on an early Honda Insight. Hells yeah - but so few were made, it'll be hard to find, and depending on your local market, might be more expensive than it should be.